Two large carbon fibre batteries in my workshop are used to provide standby AC and DC lighting for the house. The batteries are the huge Elecsol 270 AH carbon fibre types from 12voltz.com and these provide over 6 kWh of storage. 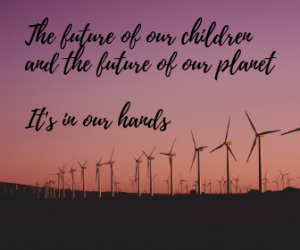 They are charged from my wind turbine and PV solar panels and I am now in the habit of using power from them to power various twelve volt lights around the house for everyday use. 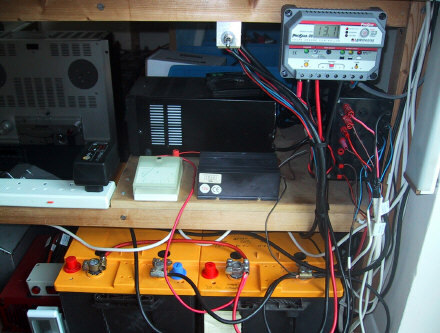 My Morningstar solar charge controller manages the battery condition for me and I have made a small 12v distribution panel which has safety fuses built-in. The total current consumption can be monitored on the Morningstar, as well as the state of charge of the battery bank. 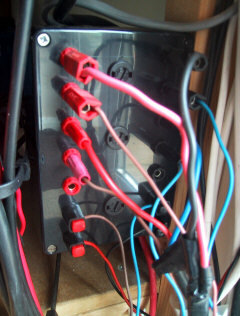 The thing to remember about using a 12 volt lighting system, is that you must size the cables to carry the much higher currents involved at twelve volts. I have run hefty low voltage fused feeds to the upstairs and downstairs ceiling areas to enable me to provide lighting all over the house. This is handy when we have a power outage, but increasingly we are using the twelve volt system for normal use instead of mains power. I have found several lights and fittings which provide a really decent light. Quite often you find that caravan type fittings are rather dim and unsuitable for regular use. The one I am using as I type this in my small office is an 18 watt PL fluorescent fitting made by Sollatek and called the Lumina 18. It has an efficient inverter and draws only 1.3 Amps. In my workshop is a 2D fluorescent fitting made by Marlec and called the LL01 Leisurelight. 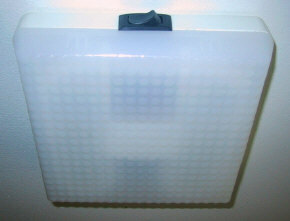 This gives a nice warm light which might be better suited for a lounge area intended for relaxation. It is rated at 12 watts, so is not as bright as the Lumina 18 mentioned above. I recently bought four 12 volt fluorescent energy saving bulbs similar to the ones from this eBay trader. 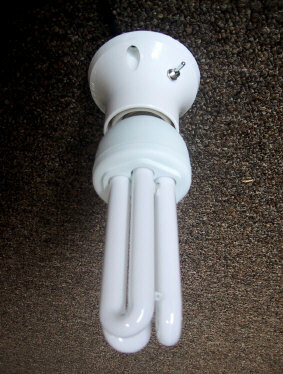 These have a clever built-in inverter in the bulb and are really bright. Mine only draw 1.5 Amps each making less than 20 watts consumption at twelve volts. They are the ES fitting type, which at least stops you accidentally plugging them into a UK BC type mains fitting! Sourcing ES lampholders is a bit tricky in the UK, but I found CPC Plc do stock several surface mounting types. I will buy some pendant types the next time we are in Europe.